Batting: Kusal Mendis 102 off 210 balls, Angelo Matthews 31 off 80 balls, Dinesh Chandimal 27 off 83 balls. Bowling: Roston Chase 4/15 in .2 overs, D Bishoo 3/48 in 9 overs, Gabriel 2/52 in 15 overs, Jason Holder 1/24 in 14 overs. The pitch had opened up on Day 5 and was going to offer uneven bounce that could become a problem for the batsmen. Sri Lanka needed 277 runs to win this test. With some hints of clouds but no real threat of any rain Sri Lankan batsmen, Gamage and Mendis came on to bat. 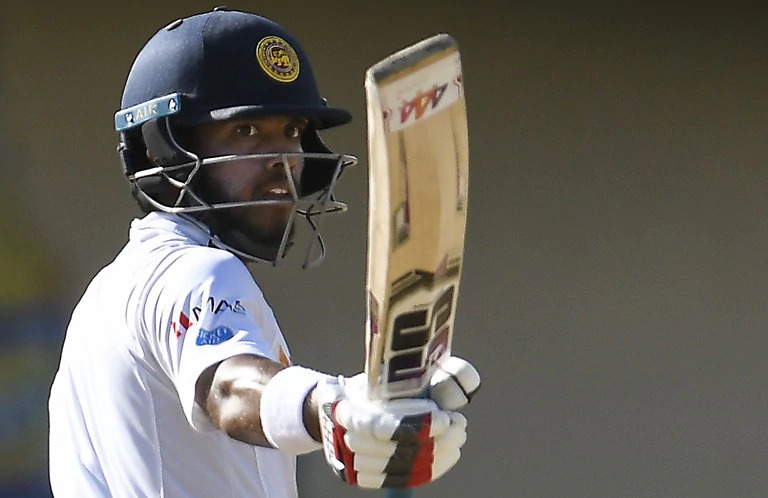 It was only a matter of time before Mendis who was on 94* runs scored the remaining 6 runs and brought up his 5th Test hundred. But, Mendis couldn’t hold out for long. As after getting hit on the finger in the previous over by Gabriel, Mendis fell to the same bowler in his next over. Gamage was now joined by Dinesh Chandimal. But the pair could only add 6 more runs to the scoreboard, before Bishoo pinned Gamage lbw. Sri Lanka had now lost half their wickets and still needed 258 runs to win this test. Chandimal was joined by Dickwella and these two were the last hope for Sri Lanka to either draw or win this test. @guerillacricket Gabriel has taken out Mendis for 102. Chandimal, the retired hurt batsman, then came out. Bishoo then took out the nightwatchman, Gamage and SL foolishly wasted their review for that dismissal. Dickwella and Chandimal fighting it out now. Both these batsmen resisted WI attack for a while and took Sri Lanka to 200 runs. But, West Indies were not giving away too many runs and this was building pressure on these two batsmen. WI needed wickets at this point or Sri Lanka would run away with this match. This is when Holder’s move to bring Chase into the attack worked. As, the spinner took 2 wickets in his 7th over to send Dickwella and Chandimal back to the pavilion. With these wickets, West Indies Vs Sri Lanka completely turned over its head. At this point, Sri Lanka were 7 down, but still needed 231 runs to win. Furthermore, with these 2 wickets, West Indies had now exclusive access to Sri Lanka’s bowling line-up. On the other hand, Sri Lanka needed a miracle to draw this test with the last 3 batsmen. But, the pitch was assisting spinners and Holder’s persistence with Bishoo and Chase was working. @guerillacricket Herath out to bat now for SL. They are 223/7 with 230 to get. Chase and Bishoo going in for the kill. Which match will end first? The 8th wicket fell in no time and this time it was Bishoo who took the wicket of Rangana Herath. And, it was only a matter of time before the last two wickets fell to Chase in the same over and West Indies won the test. 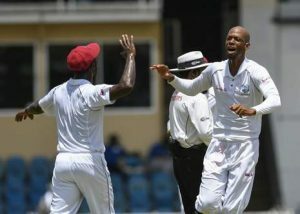 Patience paying off for West Indies…. they win a Test against Pakistan in Sharjah, then at home, beat England at Leeds and now won against Sri Lanka by 225 runs in the first Test at Port of Spain… ma’an they progressing! West Indies win a test match against a good side, when was the last time that happened? End of West Indies Vs Sri Lanka 1st Test. Join Allsportspk for the 2nd test of West Indies Vs Sri Lanka on 14th June.